There have been slight variations to the legend associated with this bridge over the years, but it always involves the same cast of characters: a young couple and their baby. From what I can gather (so far), the original version has the young couple taking their baby to the bridge for a picnic (the bridge was already closed at this point). While they were there, the couple found themselves distracted by something, allowing the baby to crawl off. It is said that if you go to the bridge, even in the daytime, you can hear the ghostly cries of a baby coming from underneath the bridge. Technically speaking, the bridge isn’t actually on Egypt Road, at least not the part of Egypt Road that is open to vehicle traffic. Rather, it sits on a closed-off portion of the road, at around the 2200 block of N. Egypt Road. If you’re heading north on Egypt Road, the bridge will be visible on your right, just beyond a metal beam that restricts vehicles from driving up onto the bridge. It is widely believed that the bridge originally sat on W. Pine Lake Road. Once the decision was made to close a portion of W. Pine Lake Road, the bridge became associated with Egypt Road since that’s the active road it was closest to. Indeed, if you continue past the bridge and hike a short distance through the woods, you will eventually find yourself on W. Pine Lake Road. Ghost stories have been swirling around the bridge off Egypt Road for decades. But to be fair, it wasn’t originally known as a Crybaby Bridge. Indeed, the earliest stories I have collected simply mentioned a “satanic cult” that practiced in the area. And as if to prove good urban legends never die (they just mutate over time), a variation of the original story claims the baby was killed by a satanic cult, apparently showing the connection between the original “cult” legends and those of the Crybaby Bridge. At present time, the earliest someone I interviewed recalled hearing the Crybaby Bridge tale being associated with this bridge was 2005. That version was the standard legend mentioned above. Prior to that, as far as the ghosts went, there were vague references to several haunting the bridge, but none of them were babies. They were usually men or women who were “victims” of the cult. The Egypt Road Crybaby Bridge tale is also somewhat unique in that it is based around an event (ie: the baby drowning) that happened in broad daylight. Most Crybaby Bridge stories have the event occurring in the middle of the night and claim that you need to go to the bridge at night in order to hear the baby crying. With Egypt Road’s bridge, however, you are supposed to be able to hear the baby cry in the middle of the day…if you’re lucky. There is another long-standing urban legend associated with this bridge, although it does not tie in at all to the Crybaby Bridge tale. According to legend, “in the 1970s” (some versions go as far as to call out 1977 as the year), an elderly woman was placed inside a cage on (or under) Crybaby Bridge and “burned alive by a satanic cult.” Police apparently wrote up the incident and staked out the area for weeks, but the case remains unsolved. Needless to say, I have yet to uncover a single scrap of evidence that such an event ever took place. However, a very real and very tragic incident did indeed take place near Crybaby Bridge. 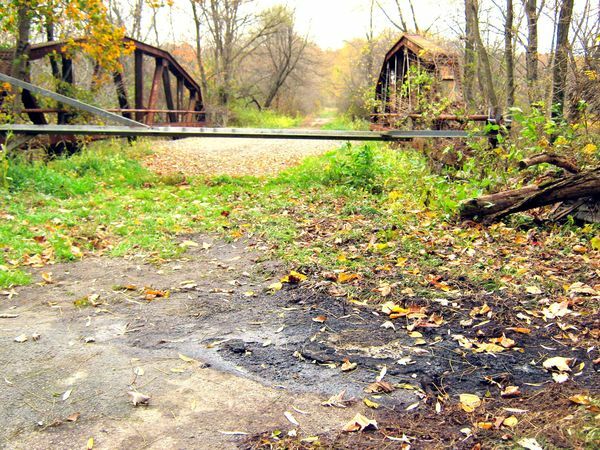 In October of 2010, the burned body of 60-year-old Ardes Bauman was found inside a van, which was parked right in front of the Crybaby Bridge. Originally listed simply as suspicious, the coroner would eventually officially declare Bauman’s death a homicide. As of this writing, the case remains open and no one has been charged with the murder. Bauman did not live on Egypt Road, so there does not appear to be any sort of connection between the bridge and the murder other than it was an isolated place to dump a body. Something to consider before you venture out to this bridge: you might encounter the living rather than the dead. And as far as I’m concerned, the living are a lot scarier! Finally, in recent years, stories about a murder-suicide taking place “near” the Crybaby Bridge have begun circulating, mainly to try and attempt to portray the bridge as being “cursed”. The facts are that in August of 2012, 47-year-old Greg Hensley got into an argument with his wife, Tracie. The argument culminated with Greg shooting his wife to death before turning the gun on himself. The murder-suicide took place at 428 Egypt Road, which is approximately 3.5 miles from the Crybaby Bridge. There is absolutely nothing to suggest there was any connection between the bridge and the murder-suicide other than the fact that both are on Egypt Road. Stay away from this bridge! There is a cult operating nearby and they will chase after you if you go anywhere neat their bridge. I’m not one to scare easily, but the bridge on Egypt Road scared the hell out of me and I even went there in the middle of the day in the summer. Lots of bugs! But once you hop over that bar they put up to keep you from driving back there it’s like you are in another world. A scary world. I didn’t believe any of the stories about the baby crying or whatever. I just sort of wanted to check out a cool old bridge. But when me and my friends were standing on the bridge just sort of looking around, we heard what sounded like a baby crying under the bridge. That was it. We took off running and I have never been back!